When they’re not chasing each other around the arena, laser tag patrons head to the arcade for the kind of stimulating games they can’t play at home: air hockey, gun simulations and anything that may win them a prize. Far from being an afterthought, the arcade at Frankie’s is a thrill-packed addition to a high-energy lineup that includes go-karts, mini golf, bumper boats — all activities customers can’t replicate in their living rooms. Blackwell said Frankie’s most popular arcade game is called Wizard of Oz, which is strategically located at the entrance and combines coins, cards and prizes. “Not a lot of games anymore have those coins, and for some reason, coins are really popular,” mused Blackwell. The Cafe at The Funplex in Mt. Laurel, N.J. Prize games are the highlight of the center’s arcade. That’s also the case for Track 21 Indoor Karting & More in Houston, Texas, where Manager Juan Solis reported strong demand for competitive, multiplayer games like air hockey, Time Crisis, and gun simulators like Buck Hunt (this is Texas, after all!). “Everyone waits on line to play them,” said Solis, who said the facility has two air hockey setups to accommodate the crowds. 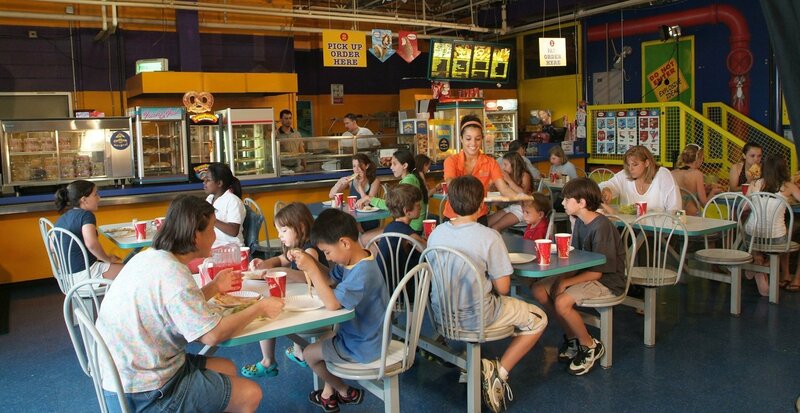 Those crowds are at their peak from late winter into early spring at many laser tag centers, managers reported. Visitation surges as cold weather sets in, the holidays are over and families are itching for entertainment before outdoor amusements open, usually in May. “This is our busiest time of year; we do a lot of parties,” confirmed Stark at Ultrazone. At Laser Quest in West Roxbury, Mass., Brady Osmond took a break between back-to-back winter parties to report that air hockey is a favorite of laser tag patrons. “It’s a classic, fun game, and just about everybody likes it,” said Osmond. His facility is one of about 50 North American locations for the Ontario-based corporation; in any given month, Osmond estimates that around 6,500 game sessions are booked at the West Roxbury arena, with numbers rising during the cold Massachusetts winter. A “stacker” prize game, in which players compete stacking blocks up to a certain level, is also popular, Osmond said — which points to a second trend in laser tag arcades: prizes. Winning a reward of any kind is a thrill patrons can’t get at home or on their tablets, and arena managers said everything from claw and crane machines to redemption-ticket games are big winners. The entire category does extremely well at Frankie’s Fun Park, said Clay Blackwell, where claws, cranes and other redemption machines run a close second in popularity to interactive games. In Bensalem, Rob Stark said Ultrazone is contemplating adding more games that lure in patrons with tickets and prizes, given how profitable they are. For a lot of players, prize games are popular “because of the actual prizes involved,” noted Osmond. At Laser Quest, Osmond said winners of Stacker and other prize schemes can take home big-ticket electronics like Beats headphones or an iPod Shuffle. Trendy gadgets such as Beats phones, Xbox One and the iPad mini are popular prizes at The Funplex. Shown is a food service area at the center. To maximize profits and draw in customers, Mazris said the key is to offer the kinds of prizes people want — not only electronics, but also toys that tie into pop culture trends like movies and video game characters, he added. “We try to cater to what’s the most popular toy,” Mazris said. During the recent winter — the season when The Funplex welcomes its highest numbers of arcade visitors — Mazris said the most popular crane game was one tied to the coveted Hatchimals toys, adorable little “eggs” that hatch into plush animals. “Around Christmas time, everyone was trying to hunt those down,” he noted, adding that laser tag visits drop slightly once the waterpark and outdoor amusement park open. Last year, with the latest release in the “Star Wars” franchise packing movie theaters, The Funplex arcade did well with prizes related to Luke, Leia and Darth Vader. “Our whole redemption desk was pretty much realigned to having the most popular Star Wars toys,” Mazris recalled. And with the craze for Pokémon Go, Mazris said, The Funplex has seen hordes of children trying to win their favorite plush Pokémon trinket out of the crane machines. Hi there,I check your blogs named “When the Focus Is Fun The Best Arcade Games for Laser Tag Centers – TAPMAG.com TAPMAG.com” like every week.Your writing style is awesome, keep doing what you’re doing! And you can look our website about free anonymous proxies.